Four quaint guest suites and rooms sit on the brick courtyard of an 1876 home with hardwood floors, french doors, cypress staircase and mantels. With private entrances opening onto the courtyard, all guest rooms have queen beds, private baths, ceiling fans and hardwood or slate floors. Each comfortable room is eclectically appointed. Gourmet continental breakfast is special here. Guests congregate in the dining room of the home to enjoy a delicious breakfast that includes fresh breads, fruit, cheeses and wonderful coffee. All spiced with stimulating conversation! Smoking outside only. Rates: $89-$250. Additional information and picture available by mail and fax. 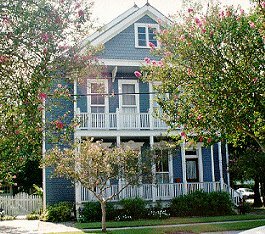 This and other New Orleans Bed and Breakfast Inns can be found here in The Register. Romantic Country Inns, Getaways and B&Bs offer a great Louisiana lodging alternative to big hotels.